Brain-computer interfaces enable commands or messages to be sent to computers by means of brain activity. Created by a consortium of academic and industrial partners, OpenViBE is free and open-source software, which makes it simple to design, test and use brain-computer interfaces. Brain-Computer Interfaces (or BCI) are communication systems that enable a user to interact with a computer or a machine using only brain activity. The brain activity is generally measured by electroencephalography (EEG). BCI is a rapidly growing area of research and several impressive prototypes are already available. The aim of the OpenViBE consortium was to develop open-source software for brain-computer interfaces, which is expected to promote and accelerate research, development and deployment of BCI technology. Key features of the resulting software are its modularity, its high performance, its multiple-users facilities and its connection with high-end virtual reality displays. The development of OpenViBE involved six academic and industrial French partners (INRIA, INSERM, FRANCE TELECOM R&D, CEA, GIPSA-LAB and AFM). Applications of OpenViBE are initially concerned with the provision of access for disabled people to multimedia and telecommunication services. The OpenViBE partners have conducted innovative research and published around forty papers covering the entire spectrum of the BCI field: neuroscience, electrophysiology, EEG signal processing, human-computer interaction and virtual reality. For example, the consortium has proposed novel techniques for processing and identifying cerebral data (eg classification of EEG signals based on fuzzy sets theory), as well as new paradigms for BCI based on neurophysiological experiments (eg the use of auditory signals for BCI). The connection between BCI and virtual reality technology has also been investigated. 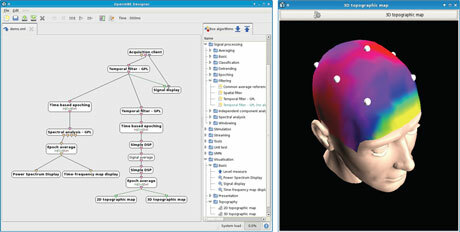 Figure 1: OpenViBE software: (left) the OpenViBE designer helps to program a BCI scenario with a graphical user interface and a graphical language; (right) 3D real-time topography of brain activity with OpenViBE visualization facilities. In parallel, the OpenViBE consortium has developed free and open-source software devoted to the design, testing and use of brain-computer interfaces. OpenViBE processes brain signals: it can be used to acquire, filter, process, classify and visualize brain signals in real time. It is also notable for its high modularity. The platform comprises a set of software modules written in C++ that can be integrated easily and efficiently to design BCI applications. OpenViBE proposes a user-friendly graphical language to allow non-programmers to design a BCI without writing a single line of code (see Figure 1). As such, OpenViBE addresses the needs of all users, regardless of whether they are programmers or not. OpenViBE is portable, independent of hardware or other software, can run under Windows and Linux and is entirely based on free and open-source software. Various 2D and 3D visualization tools allow brain activity to be displayed in real time. Thanks to its generic acquisition server, the platform is compatible with many EEG machines. OpenViBE also includes pre-configured scenarios that can be used for different applications including neurofeedback and BCI. The OpenViBE software is freely available from the INRIA forge under the terms of the LGPL licence. It has already been downloaded by numerous users, and an initial two-day training session was organized in Rennes, France, in January 2009. Several applications and demonstrators have been built based on OpenViBE, and illustrate the numerous possibilities offered. For instance, a mental speller enables words to be written by thought, using a famous brain signal called P300. A video game inspired by a famous sequence from the movie Star Wars was also developed, in which users lift a virtual spaceship in the air by way of motor imagery. After an initial baseline-measuring phase, users can perform real or imagined foot movements to lift the spaceship as if they were controlling the force with their minds (see Figure 2). Figure 2: OpenViBE applications: virtual-reality application called Use-the-force, in which a participant equipped with an EEG cap is trained to control his mental activity. Imaginary foot movements control the take-off of a virtual tie-fighter, the famous spaceship from Star Wars. The OpenViBE project continues with national funding for both advanced research on BCI and future developments of the open-source software. One follow-up project is OpenViBE2, which is funded by the French National Agency of Research and will focus on video game applications. The project will assess future impacts of BCI on video games by making prototypes and testing them in a fully working environment. The OpenViBE2 project will involve ten partners (including game editor UBISOFT) and will run for three years, commencing in the fall of 2009.